Spanish pressure suit. 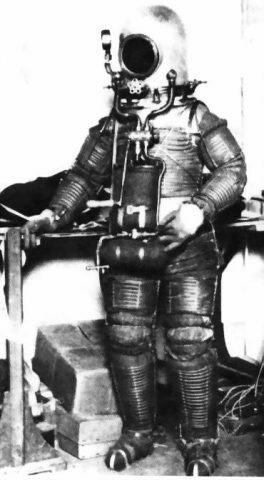 Spanish Colonel Don Emilio Herrera Linares designed and built a full pressure suit in 1935, which was to have been used during an open-basket balloon stratospheric flight scheduled for early 1936. The Spanish Civil War intervened. Herrera chose the Republican side, and the rubberized silk suit was cannibalized to make rain ponchos for Republican troops. In 1939 he fled to France, where he died in exile in 1967. Herrera's suit featured an inner airtight garment (tested in the bathtub in his flat in Seville), covered by an accordion-like, pleated and jointed metallic frame. Joints were made for the shoulders, hips, elbows, knees and the fingers. When tested at Cuatro Vientos Experimental Station, the suit's pressurized mobility was found to be "thoroughly satisfactory", according to its inventor. If this was he case, it means that he solved one of the main problems of pressure suit design decades before B F Goodrich or David Clark! The suit worked on a Davis-type close circuit system, and the Colonel designed a special "carbonless" microphone to avoid any eventual spontaneous ignition in the pure oxygen atmosphere. The helmet faceplate had three glass layers - one unbreakable, another with an ultraviolet filter and the outer one opaque to infrared - all anti-fog treated. Herrera included electric heating, but when the suit was tested in the high-altitude chamber, he noticed that even when the surroundings were cooled down to -79 �C, temperature in the garment rose to 33 �C. A trained engineer and scientist, he soon realized that rarified atmosphere and vacuum actually isolated a pressure suit, and that the task was not to warm it, but to remove body heat by some method. Herrera was part of a movement to "to purify, repair and to glorify the Spanish Language", and therefore the used "pure" Spanish words in place of the commonly-used words taken from French or English. He referred to large aircraft such as the Do X or Boeing XB-15 as "megaaviacion". Flight above 12,000 meters he dubbed "estratonautica". Therefore he called his stratospheric suit an "escafandra estratonautica". Family: Space Suits. Country: Spain. Bibliography: 567.